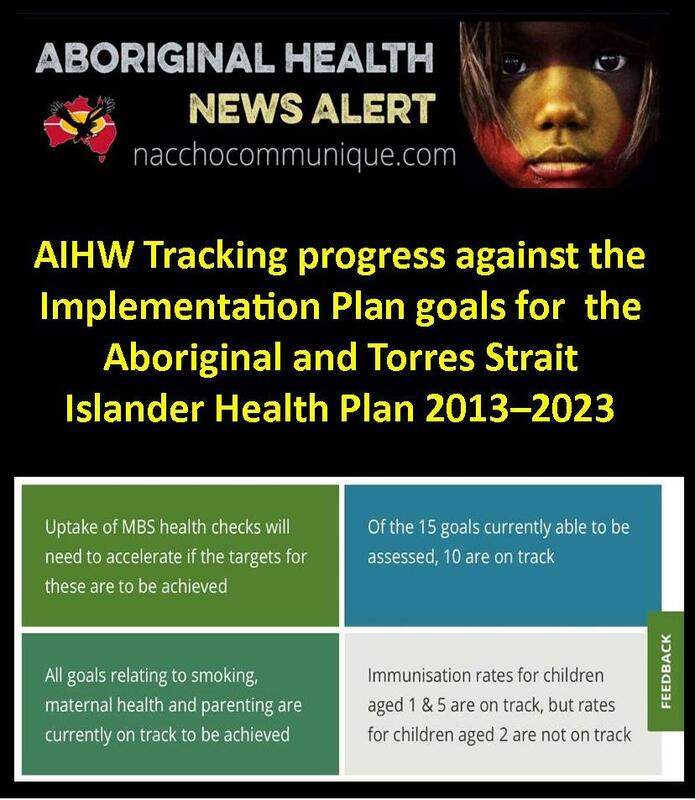 In October 2015, the Australian Government released the Implementation Plan for the National Aboriginal and Torres Strait Islander Health Plan 2013–2023. The Implementation Plan outlines the actions to be taken by the Australian Government, the Aboriginal community controlled health sector, and other key stakeholders to give effect to the vision, principles, priorities, and strategies of the National Aboriginal and Torres Strait Islander Health Plan 2013–2023. This September 2018 update provides new data for 8 of the 20 goals, that is, those relating to childhood immunisation and health checks. For these 8 goals, 3 remain on track, and 5 are not on track. New data for the remaining 12 goals is not yet available, with ‘on track’ status for 5 of these still not able to be assessed.